View from Right Field, Camelback Ranch, Phoenix, Az. 13,000: 10,000 seats, 3,000 berm (grass) seats. Press boxes and suites at Camelback Ranch. Camelback Ranch-Glendale is a stadium in Phoenix, Arizona owned and operated by the city of Glendale, Arizona. It is the spring training homes of the Los Angeles Dodgers and Chicago White Sox. The stadium holds 13,000 people. 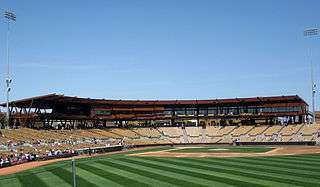 Camelback Ranch replaces Holman Stadium in Vero Beach, Florida as the Dodgers' spring training home, and Tucson Electric Park in Tucson, Arizona as the White Sox spring training home. The park is also home to the Arizona League Dodgers, who moved to Camelback Ranch with the Major League team in 2009. The Arizona League White Sox play there as of 2014, after the White Sox rejoined the Arizona rookie circuit. The stadium name is derived from the longstanding name of the property it is built on. Roger Bossard, White Sox head groundskeeper, designed and put in all of the fields for the Dodgers and the White Sox. During the park's first year, Dodgers fans have noted and expressed their dismay at the absence of the Dodger Dog at the ballpark concession stands. The following season, Dodger Dogs began to be sold at the ballpark. In 2015, the Dodgers drew 147,066 fans to their 15 spring training games at Camelback Ranch (an average of just over 9,804 per game), setting a new franchise spring training record. 10,000-plus seats, 3,000 bermed grass seating. There are 8 full suites, 4 mini-suites, a press box, a suite-level party deck, and a series of outfield terraces that create party areas. 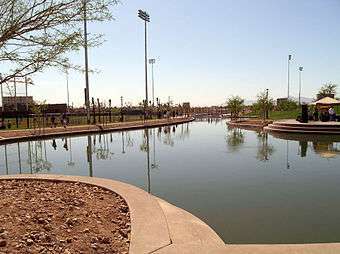 A fish-stocked lake that separates the Dodgers and White Sox training facilities and offers aesthetic beauty and irrigation to complex landscaping and playing fields. Over 5,000 plants and trees. Stadium playing field sunken 12 feet below grade to improve sightlines. Gabion (rock) retaining walls, earth-tone (caramel) stadium seat color, and other appointments—that blend with the natural desert colors of Arizona. Additionally, construction utilizes sweeps and angles instead of a big-box look. Main entrance (Pavilion) in center field. Access tunnels for players to enter the stadium from their clubhouses. Walk of Fame along the water feature. ↑ "Glendale's ballpark gets a name: Camelback Ranch". Arizona Republic. 2008-11-21. ↑ Bill Plaschke (2009-03-08). "Dodgers' new spring home in Phoenix is a site to behold". Los Angeles Times. ↑ Stephen, Eric (May 31, 2015). "Dodgers set spring training franchise attendance record". truebluela.com. Retrieved April 1, 2015.